Founded in 2009, Arquetopia is an award-winning, Mexican official nonprofit foundation run entirely by artists. It has since grown to include the premier artist residency program of Mexico and Latin America with extensive collaborative networks in Puebla and Oaxaca. Their resident artists have come from dozens of countries on six continents. They are proud to say that many of their artists have returned for residencies with them even two and three more times. Arquetopia’s Artist-in-Residence Programs offer important professional opportunities for emerging and mid-career, national and international contemporary artists, designers, curators, researchers, and art educators age 25 and over. E-mail info@arquetopia.org for further information and/or to apply. Arquetopia’s programs are based on a non-exploitative model promoting social consciousness. Residents are strongly encouraged to explore various ways of cultural exchange as part of their artistic and/or research goals and to actively engage in critical discussions as part of their residency experience. As Arquetopia’s mission is to promote social transformation, understanding Mexico’s context, and specifically Puebla and Oaxaca’s cultural complexity, is key for a successful cultural exchange. 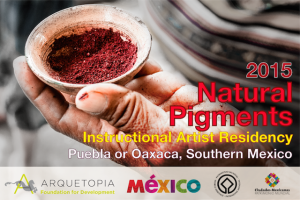 They welcome artists, designers, curators and historians from diverse backgrounds and disciplines who are interested in creating work inspired by art, elements, techniques or processes that are specific to Mexico and/or unique to Puebla or Oaxaca. Deadline: Sunday, November 2, 2014. Duration: Terms of 3 to 24 weeks; varies according to program.